How Do You Find the Solution Set for a Relation If You Know the Domain? 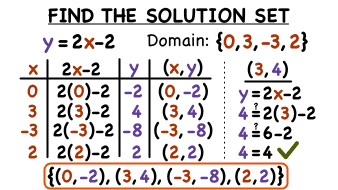 To find the solution set of an equation with a given domain, you first need to plug each value in the domain into the equation to get the respective range values. Create ordered pairs from these values and write them as a set. That set is your answer! Learn it all in this tutorial! Ordered pairs are a crucial part of graphing, but you need to know how to identify the coordinates in an ordered pair if you're going to plot it on a coordinate plane. In this tutorial, you'll see how to identify the y-coordinate in an ordered pair! When an equation has two variables, the set of ordered pairs that are the solution to the equation are called the solution set to the equation. In this tutorial, you'll learn the definition of a solution set and see an example. Take a look!